post-production (logistics, sales and service). in NSW will support manufacturing businesses to become more profitable and competitive. NSW is fast becoming a base for the most valuable and skill-intensive parts of the production process. This includes high-tech design and development, innovative research, product customisation, and client-focused support and repair services. By expanding business operations beyond production, NSW manufacturers are becoming increasingly competitive in globalised markets and unlocking new revenue streams. Western Sydney is fast becoming a major focal point for investment and is seen as an important source of growth and innovation in NSW. The region is home to a large number of small and medium-sized enterprises that produce highly innovative products, export globally and are keen to transform their business processes. Many of the disruptive technologies of Industry 4.0 are driven by small innovative companies such as those in Western Sydney. As part of the Western Sydney City Deal, the NSW Government, in partnership with the Commonwealth Government, will develop a high-tech, state-of-the-art Aerospace and Defence Industries Precinct adjacent to the new Western Sydney Airport. The Western Sydney Aerotropolis will provide advanced food and beverage manufacturers the opportunity to be part of establishing an agribusiness precinct. The new precinct will encourage combining ground-breaking research programs with the latest technologies and systems in food and beverage processing to grow agricultural productivity and the export of premium products from Western Sydney. Changes in technology and processes are transforming the building and construction industry. The billions of dollars of public investment in infrastructure planned for Western Sydney is supporting the development of a modern construction industry and facilitating the adoption of new advanced manufacturing processes and business models across the industry. Leading international manufacturers have also been thriving in regional NSW, attracted by its skilled workforce, low-cost environment, access to markets and world-class R&D centres. 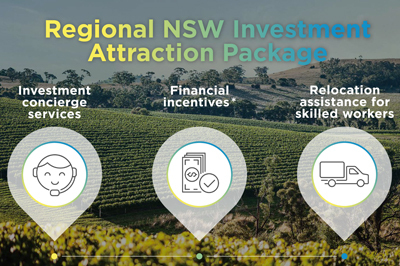 Regional NSW is a base for valuable and skill-intensive production processes, including high-tech design and development, innovative research, product customisation, and client-focused support and repair services. It offers advanced manufacturing strengths and opportunities in industry sectors such as aerospace, aviation, energy, electronics, information and communications technology, marine, health and medical, agribusiness, renewable energy and defence.